Starring: David Duchovny, Julianne Moore, Orlando Jones, Sean William Scott, and more. Requested Review from Anthony Scafede.! Bringing you a bit of nostalgia on this one from my younger days. I was requested to review the movie ‘Evolution’ by a friend of mine. A movie I watched countless times when I was around 15 but have not watched in a long time. More notably now that I am much more of a critical-minded film watcher now. So how does the sci-fi comedy fare against the critical mind of Oberrated? Does it still remain a teen-year favorite of mine or did the feelings change now with age. Let us find out! When a mysterious asteroid hits Earth and a pair of science-savvy but simple college professors (David Duchovny, Orlando Jones) discover it and the possible alien life it could obtain, they collect samples and begin to research what secrets it could contain. However, when their research is examined by the government, they become shut out of the project. The alien life then is witnessed to be dangerous to humans, causing the team of scientists to find out an efficient way to stop the extra-terrestrial life from spreading when they government plans to eliminate it in a way that does not kill it, but spreads it. This was quite an entertaining review for me. To view a movie I enjoyed when I was younger and now watched again at an older age. Things have definitely changed in my opinion of the movie but it was still an entertaining watch. Going in, if you watched a trailer or were aware of the cast or story, you would already know that it is far from a serious tone aside from knowing it is a comedy. While I would definitely label it what I call “stupid humor”, I enjoyed it for what it was worth… Orlando Jones is by far my favorite part of the movie. Everything he says is comedic, even when it is purposefully meant to be funny or just straight shot. Some of his lines delivered made me laugh out loud when I was younger and even more so as I am older… At a younger age, I can clearly remember not being so critical of actors/actresses but now, quite the opposite, and I stand at an agreement as I always have been on Sean William Scott. He always plays the same character and has always gotten a simple pity laugh out of me as he always has. I can say I have only enjoyed him in ‘The Rundown’ but the constant stays true; he is the same character, different film. Overall, ignoring a comical dumb plot and some forced “realizations” throughout the movie. 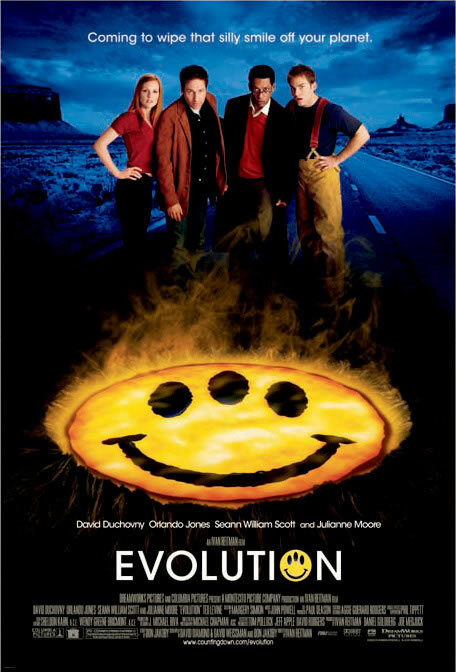 ‘Evolution’ is still an entertaining flick for me to sit down and just turn off my mind too. Pure stupid entertainment and fun. Nothing special to go crazy for. Still an old favorite of mine.